ASHTABULA – A drop in the real-estate market 40 years ago evolved into Barter House Design Center, 1477 Bridge St. The business these days has nothing to do with buying and selling real estate, but everything to do with carpeting, floor covering, mattresses and other furniture. At the top of Bridge Street, the business is operated by Alana L. Miller and takes up three storefronts. Miller said her father, Alan Lampela, was in the real-estate business when interest rates jumped and the business went down. He got into liquidating estates. He found a home in the Ashtabula Harbor and began selling used furniture. From there, he obtained racks of flooring. “He kept some of the used furniture,” she said, although that was phased out a couple of decades ago. Lampela still likes to visit customers’ homes and cut carpeting, but Miller operates the business today. “One day he turned the lights off. The next day I turned the lights on,” she said. “It’s evolved quite a bit. I’ve been here 18 years,” she said. The business services businesses and residential customers and includes installation. Customers can order from what is in the showroom or remnants in stock or obtain quickly from its suppliers. The remnants offer a big discount and are good for smaller living rooms and bedrooms. The big seller these days is speckled carpet that is stain proof. “It’s great carpet for families. They don’t have to change their lifestyles,” Miller said. “Gray tones are in right now. They are huge,” she said. “We are a traditional floor-covering business. We are the family store option rather than the big box store. We have the personal touch. We are there every step of the way. We treat clients just like they are part of the family. The big thing is customer service. “We want them to feel l important, like they matter. A lot of them are repeats,” she said. About 18 years ago, the business added its warehouse option, with its own racks of carpeting and vinyl floors. “We cut out the middle guy. We get a better buy. You get a better buy,” she said. Barter also gets factory-direct mattresses. The store is limited in the amount and types of furniture it stocks, partially because of space. It tends to spotlight special accent pieces. She said she loves being on Bridge Street where everyone knows everyone and supports each other. “The Harbor holds a special place in my heart. Bridge Street is really a fantastic place,” she said. 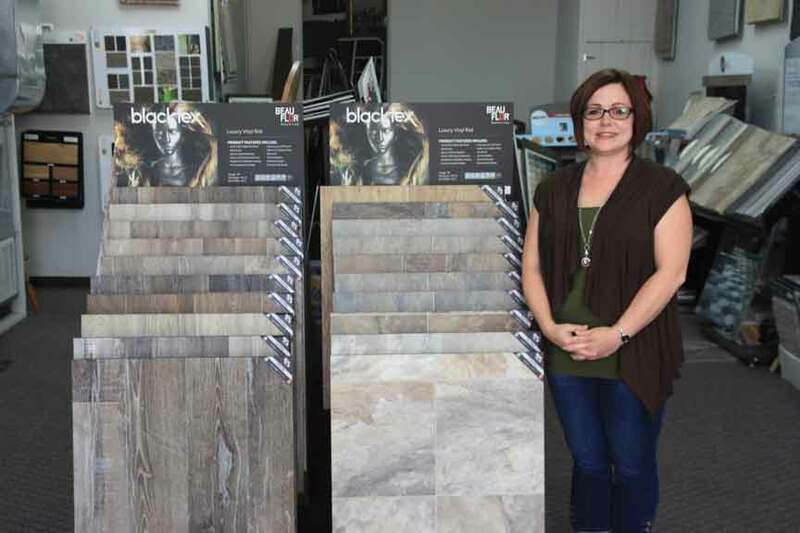 The store is open weekdays, 10 a.m. to 5 p.m., and Saturdays, 10 a.m. to 3 p.m.
Alana Miller has a full selection of floor coverings, including carpeting, mattresses and some furniture at the Barter House Design center, 1477 Bridge St.